Click here to return to Chapter I "The Chronicled History of the Building"
Click here to return to Chapter II "On the Buildings which preceded the existing Cathedral"
1. THE TRANSEPTS The building having been brought to the state represented in plan No. 2 [Plan of 1200, at right], by the substitution of Roger's choir for the previous one, was not long allowed to remain without fresh improvements, The Norman transepts, destitute of aisles, were in the next place removed, and the magnificent existing Early English transepts, with double aisles, were erected. The plan of the building after the completion of these transepts is shewn in No. 3 [Plan of 1250, see below]. The design of the two transepts is very similar; they each belong to the early period of the Early English style, before the tracery principle had been introduced. and therefore judging from examples of known date, would probably have been completed, or very nearly so, before the year 1250. The respective gables of these transepts differ exceedingly in composition, and are well worth studying in comparison; but in other respects, the differences are merely in detail. In the south transept the western aisle is considerably narrower than the eastern, which is not the case in the north transept. I shall have occasion below (in chap. iv.) to describe the remarkable disposition of the piers and pier-arches of these transepts, which has arisen from some very curious and instructive changes in connection with the subsequently erected nave and choir. Of written history, the statement of Stubbs that John le Romain built the north transept and central bell tower at his own expense, is all that remains. Unfortunately, we have no certain information respecting the time at which he lived.m His son was archbishop from 12S5 to 1295. Archbishop Grey, however, who held the see from 1215 to 1255, founded a chantry in 1241 at the altar of St. Michael, and was buried there; the chapel of St. Michael being the central compartment of the eastern aisle of the southern transept. Within this still remains the magnificent canopied tomb of the archbishop,n and the pier-arch under which it stands is made wider than the others, apparently to give it importance. The usual custom of burying founders in the middle of their work appears to have led to this arrangement, but it may only have reference to the archbishop's own chantey, the date of the foundation of which, however, shews that the transept was complete in 1241.o Thus as the north transept corresponds so closely in design, that it must have been carried on immediately after the stone work of the former was finished, even if not simultaneously, John le Romain, holding office between 1250 and 1260, may have taken so great a share in the completion of it as to have obtained the whole credit, according to the usual practice of medieval biographers and architectural historians. His great central bell-tower, whatever it was, has entirely disappeared, being now replaced by the present tower of the fifteenth century. The practice of burying the founders in their work was closely followed in this cathedral. Archbishop Roger was buried "in medio chori," Archbishop Melton in the nave at the font, and Thoresby in the presbytery. I have shewn below p that twelve years ought to have been sufficient for the erection of the two transepts. This, if the south were completed in 1241, would place the whole between 1235 and 1247, supposing no intermissions, but the work evidently lingered. The nave and the later rebuilding of the church The cathedral in the year 1200, as shewn in No. 2 [Plan of 1200-at right], was a Norman building, in which the scale of the different parts was sufficiently well proportioned, and although the eastern end was of a more enriched style than the western, yet they were both Norman, and thus the whole was tolerably homogeneous. But the new transepts were on a scale of so much greater magnificence, that it can scarcely be doubted that they were intended by their founders to be the beginning of an entire transformation of the church; their total internal width was about 95 ft. and that of the Norman Nave but 83 ft. And yet no sooner are they completed than a new nave is begun, again introducing a new style and still greater dimensions; whose internal width is 103 ft., and whose clerestory walls are 18 ft. higher than those of the transepts; and, as the subsequent history of the building shews, this new nave was only a part of the project which was fully carried out by the completion of the present presbytery and choir, and of the three towers. It must be observed that although the new nave exceeded the transepts in total width, yet that their central aisles have nearly the same width respectively, the difference being in the side aisles. Plan No. 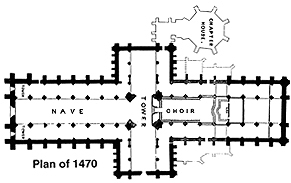 2 [Plan of 1200] is the complete Norman church, plan No. 5 [Plan of 1470] the complete pointed church, and the intermediate plans, No. 3 [Plan of 1250] and 4,[Plan of 1370] shew the gradual steps by which theq one was transformed into the other. The elevations of the nave and the choir Next the choir was erected as in No. 5 [plan of 1470- above], and lastly the central tower and the western towers were raised above the roof. The design of the nave is wholly different from that of the transepts, and the latter has not exercised the slightest influence upon the composition of the former, although the reverse has been frequently the case when a Decorated building, has been added to an Early English one, as may be seen at Ely, Westminster, St. Alban's, &etc. The Early English transepts are divided into pier arches, triforium, and clerestory, of which the respective altitudes, reckoning from one string or tablet to another, are about 40 ft., 23 ft., and 14 ft. But in the nave there are but two great, divisions, of which the lower one, containing the pier arches, is 51 ft. high; the upper one, 43 ft. high, is occupied by a large clerestory window of five lights, with geometrical tracery and a transom across the middle. The lights above the transom are glazed, and constitute the real window, but the lights below the transom (if the phrase can be applied to openings so perfectly dark) are open, and as the roof of the side aisle abuts against the transom, the space behind them, and to which they communicate, is the interval between the stone vault of the aisles and its wooden roof; they thus serve the purpose of a triforium. This artifice of construction may be better understood by referring to the section of the nave in Britton's plate 19. If the nave, presbytery, and choir be compared together, it will at once be seen that the two latter are professedly copies of the first, continuations namely of the same design. The general distribution and the contrivance of the triforium, as well as the plan of the piers, are the samer , the differences are in detail merely, but on that account so exceedingly interesting, that I shall proceed to point out a few of the principal. The moldings of the pier arches are shewn in figure 3: they appear to be the same at first sight. Each pier arch consists of two orders of voussoirs, and of a hoodmold.s The upper orders, 4, C, -E, respectively have the same moldings in all three arches, but the lower or sub-order of moldings which form the soffits are all different. B, in the nave, consists of five ribs, of which the three lower have fillets or keels, and they are all separated by a single narrow hollow between two fillets. In the presbytery soffit-mold, -D, there. is more variety, the same number of ribs, but the intermediate one is of a simpler form, and the intervening hollows are simpler. The choir, F, has six ribs instead of five, they are all alike, and separated by the same hollows and fillets as in the nave, but the hollows are larger and the ribs smaller, and, lastly, a hollow occupies the soffit of the arch instead of a rib with a fillet as in the others, and this last character has so conspicuous an effect upon the eye that it enables the two classes of arches in the presbytery and choir to be distinguished at once, and thus points to the boundary between the work of the two. The pattern of the tracery in the windows is the next feature which exhibits differences. In the side aisles of the nave and in its clerestory, the tracery is geometrical, but in the side aisles the pattern is much simpler than in the clerestory; the former, and of course the earlier, as being lower in the building, is in three lights without subordination of moldings; but the latter is in five lights, with a rich head and a complex subordination of moldings. At the west end of the building the geometrical pattern of the side-aisle windows is employed for the western windows that terminate those side aisles, and which form part of the lower story of the western towers; but the great west window, and those of the next story of the towers which range with the clerestory windows of the nave are filled with exquisite flowing tracery. t In the next portion of the work, namely, the side walls of the presbytery, we find the pattern represented in fig. 4. This is midway between flowing and Perpendicular tracery, for although the pattern traced out by the first lines or first order of tracery moldings is a kind of reticulation that not unfrequently occurs in early Perpendicular windows; yet the way in which each of the meshes (so to speak) of .this reticulation above the lights is filled up, has a decidedly flowing character, which is given to it by the inclination to right and left of the trefoiled compartments, and by their flowing junction with the quatrefoil above them. But the contrast of characters is still more admirable brought out between the clerestory windows of the presbytery and of the choir represented above. It is clear that these are intended to match. The number of lights are the same in each, and so is the system of subordination, by which two lights on each side are cut off, and included in a separate arch. (This indeed is also derived from the nave.) But in the presbytery a transom crosses the tracery and connects these arches. In the choir, on the contrary, the two central monials run up with decided Perpendicular characteru to meet the window arch. In the presbytery these monials run up, but in the subordinate order of moldings only, so as not to be prominent. The head of the presbytery window is occupied by a series of compartments that recline right and left fan-wise, and have many flowing lines in them, strangely mixed with others of decided Perpendicular character. But in the choir the whole of the filling up is of the most decided Perpendicular character, and shews that when this part of the building bad been reached the Perpendicular style had become fully established. The east window of the presbytery is a magnificent specimen x of the same undecided character as the other windows of thin; part of the building. The tower windows of each of the three towers above the roof present nothing unusual, and are of decidedly Perpendicular character. But it may be worth remarking that the western towers, as this history has shewn, contain in their three stories specimens of the three styles oil tracery, one above the other. There are a few other differences of detail between the presbytery and choir, which I noted on the spot, and which are perhaps hardly intelligible without a drawing, but, by the help of the following notes, may be seen in Browne's plates, 130 and 131, or may be understood from Britton's elevation of the presbytery (pl. 25). In the presbytery the monials of the clerestory have long cylindrical base plinths, and trefoiled compartments between them at the bottom of the triforium. The capitals of the triforium arches also embrace the small outer shafts of the window arch. The transom of the triforium openings is rather higher than the middle. In the choir, on the contrary, there are short plinths with cinquefoil compartments between the capitals; the latter stop short of the outer -,hafts, and the transom is lower down. In the presbytery the passage of the clerestory gallery runs outside the windows, and between them and a peculiar outer frame of square-headed tracery, which is omitted in the choir, and there the passage is within, instead of without, the glass. The sill of the triforium is much narrower in the presbytery than in the choir. On the outside the presbytery has broad buttresses with high pinnacles, and the choir has narrow buttresses with lower pinnacles. The pattern of the side-aisle windows is the same in the two, but in the presbytery the arch-bead is much more acute than in the choir, by which also the proportions of the pattern are altered. In order to understand the written history of the parts of the church we have been considering, which is unfortunately scanty and obscure, it is necessary to form some opinion of the number of years that were probably required for their erection. I have carefully compared the amount of work in each of these parts of the cathedral of York respectively with that contained in six cathedrals (or parts of cathedrals) of the first class, for the erection of which the time consumed has been recorded. The result to which I have arrivedy is that twelve years ought to have sufficed for the transepts, sixteen for the nave, omitting the upper part of the west front, nine years for the presbytery, and eleven for the choir. This is the average result of six buildings, some of which were, carried on with great funds, some with small; some without interruption, some with periods of intermission. They were all roofed in during these periods. The three towers of York are not included, neither is the casing of the central tower piers. The wooden vault appears to have been in every case an after-work; it is not included in the above estimate z ; but if six years be allowed for it, then it appears that in about fifty years the entire cathedral, without its towers, might have been built. The actual written history of the nave is but scanty ; the foundation date, AD, 1291, is recorded by Stubbs, as well as the fact that it was begun on the south side towards the east; and as we must suppose that the wall of the side aisle was the first thing erected, the point f in plans No. 3 and 4, where that wall joins the Early English transept, is thus shewn to be the starting place of this great work. This point and the entire side aisle wall, north and south as well as the west front, is obviously (plan, No. 3) so far removed from the walls of the Norman nave which was then standing that they might have been erected without disturbing it, and this to a certain extent, as far at least as to the lower part of the west front with its geometrical windows, was probably the case, as we have the authority of Gervase to shew that such a system was pursued at Canterbury a . The arcade work in the interior must have been finished afterwards. An indenture for glazing the great west window, dated 1338, is preserved by Torre, b and in the same year Archbishop Melton is recorded to have given to the fabric the sum of 500 marcs, or according to another authority 600 marcsc , if indeed these sums are not separate gifts, for Stubbs has told us that this prelate gave 700 pounds, (a sum about equivalent to 1100 marcs,) and that by this the western extremity of the church was finished. I have already stated that the west window and the two windows of the second story of the western towers are of flowing tracery, and there can be no doubt that this part of the work is meant when Melton is said to have finished the west end. The elaborate western door has geometrical tracery. The coincidence in date of his gift with the contract for glazing is sufficient to shew the connexion between this part of the work and the archbishop in question. And as the glazing would not be put in until the roof was completed, the nave must at this time have been roofed in; bow long before we cannot tell. As the preparation of the glass would occupy some time, the stone-work of the tracery was probably going on when the contract was made. The completion of the nave, exclusive of the wooden vault, is thus fixed to about 1340, little less than fifty years after its first stone was laid; and so we have the beginning and the end, but of the intermediate progress of the building we have nothing to judge by but the language of indulgences and petitions, always exaggerated. From the expressions made use of in these documents, it is clear that the work was carried on slowly, and with intermissions; the petition in 1298 proves that the Norman nave was down; but the side walls, which would have required about six or seven years if carried on steadily, may have been then in a state of forwardness. Grenefeld's gifts at the latter end of his pontificate, and the repeated indulgences issued by his successor at the beginning of his, are evidences of exertions made to complete some part of the work, and as fourteen years intervene between these indulgences and the work of the west end in 1338, it may be fairly concluded that the new nave, exclusive of the flowing Decorated work at the west, was completed about 1324 h , at the beginning of Melton's episcopate, and that the work then stood still for the fourteen years, after which the west end, as we have already seen, was taken in hand about two years before Melton's death in 1340. The lower story of the western towers, and the central door, although geometrical in their tracery, are in many respects in an advanced style to the rest of the nave, they were probably begun after the latter was finished and roofed, this will place their date ,it the beginning of Melton's pontificate. The nave, and indeed the whole church in its highest parts, is covered with a wooden vault, made in the form of a stone ribbed vault, with bosses, probably on account of the great span of the central aisle which alarmed the masons. The side aisles are vaulted with stonei . Vaults however, whether of wood or stone, being beneath the actual roof, were not necessarily set about immediately after the building was in other respects completed, and covered in for use, but admitted of being postponed indefinitely, and indeed we often find cases in which, although prepared for, they never were added. It is not therefore surprising to find that in 1354, fifteen years after the time which I have assigned for the completion of the nave, the wooden vault was in progress, which is proved by a letter from the chapter to the archbishop, (vide Browne, p. 133,) requesting permission to cut timber for that purpose, in accordance with his grant. 3. The Chapter-House The chapter-house must, by its style, have been erected at some time while the nave was going on, and apparently during the interval between the completion of the lower part of the west front and the upper part, in which the flowing tracery is introduced, for the chapter-house has magnificent geometrical tracery of a very advanced character. Mr. Browne' fixes the date of its commencement about 1280, and its completion about 1340, which appears to me to be too soon by fifty years for the beginning. His principal reason seems to be that chapter acts, from 1223 to about 1300, are dated "in capitulo Eborum," but after 1300 "in capitulo ecclesie," or " in loco capitulari ipsius ecelesie." In 1342 and afterwards he tells us that the phrase used is " in domo capitulari;" and this last, in fact, shews that a chapter-house was then in existence. But the word " capitulum" is by no means confined to that meaning, and is commonly used for the church in general, or for the presbytery in particular, as Ducange will shew. Probably some part of the church was assigned as a chapter-house, or " locus capitularis," until a chapter-house was built; or a chapter-house of some kind may have existed on the site of the present one'. 4. The Presbytery and Choir At the completion of the nave the church was in the following state, as shewn in plan No. 4, (omitting the presbytery.) The choir and its crypts were of enriched Norman, the work of Archbishop Roger. The central tower had the Norman piers of Archbishop Thomas, and above them the Early English campanile' of Johannes Romanus the elder. Perhaps the Norman tower piers were clothed with Early English masonry. The transepts and the nave were the same that now remain; but the western towers of the nave rose no higher than the roof. The next work which was undertaken was to replace the choir of Archbishop Roger by an eastern building, on the same scale of magnificence as the nave. The history of this building is an exceedingly curious one, and Mr. Browne has, by his industrious researches amongst the chapter documents, brought to light many new documents, which serve to illustrate this history. It is therefore with great regret that I feel myself compelled to differ from him most essentially in the applications which be makes of the whole of these documents to the history of the work. I shall presently proceed to analyse them, and endeavour to explain my own opinion with respect to their meaning. Stubbs, or rather his continuator, has given a concise and extremely valuable sketch of the proceedings of Archbishop Thoresby. Upon this Mr. Browne has, most undeservedly, endeavored to throw discredit. The passage in question was evidently written by a person well acquainted with the affairs of the church, and so many of the statements contained in it are confirmed by the chapter documents, that I see every reason for giving to the whole the most implicit confidence. I will take these statements in order; first with respect to the beginning of the work, which Stubbs assigns to the 30th July, 1361. ' A resolution of the archbishop and chapter, dated July 20, 1361, declares "that every church should have its different parts consistently decorated, and that the choir, which is destined for the offering of the sacrifice, should be more especially ornamented." " Moreover, that in the church of York there was no suitable place where the mass of the Virgin could be daily performed with proper decency ;" they therefore agree to " begin such a choir, and that the old choir, which, compared with the beauty of the nave, seems rude, should be taken down piecemeal, as it may seem expedient, and used for the completion of the new choir. They also agree that the decayed hall and. chamber at Shirburn be taken down, and its materials at once applied to the finishing of the work n."
Next with respect to the annual gifts of the archbishop. The statement of Stubbs is completely confirmed by the bishop's register, which contains a series of orders for the payment of various sums to the fabric. Thus the first on the 23rd of April, 1359, E20, " in celeriorem consummationem fabrice ecclesie;" then in Nov. and Jan., 1360, E20 each ; in April, 1361, E30, -ad fabricam." These sums were probably applied to the completion of the vault of the nave, or to the preparations for the new choir. On the 1st of August, 1361, is an order- for the payment of one hundred marks sterling (E66. 13s.) " given to the fabric -newly begun, at the laying of the first stone thereof by ourselves ;" then in Oct., 1361, E50 ; and afterwards k100 in each half year, with some occasional irregularities, to the last payment in July, 1373, thus completely justifying the accuracy of the historian. As to the indulgences which Stubbs mentions, Mr. Browne's pages record them in abundance. And for the tombs of his predecessors, the bishop's register contains several orders for payments to this effect. First, Feb. 18, 1369, to pay Master Robert de Patryngton, master mason of the fabric of the new choir, for the work of six marble stones, prepared for the tombs of our predecessors, ten pounds out of the hundred which the archbishop had promised to the fabric at the coming Easter. Secondly, Aug. 23, 1369,~ ten marcs to Robert de Patryngton in part payment of forty pounds, for making certain marble stones. Thirdly, June 12, 1373, one hundred shillings to Robert de Patryngton for the work of the tombs. Sepul. archiepiscoporum in orient. parte ecclesiae. Thomas Junior obiit anno Dom. 1113 5 Idus Mart. In bore. lat. Capel. S. Mar. ad ecclesiam suam anno Dom. 1476. This memorandum, from the nature of it, was evidently written by Leland as he went the round of the church, and not from any manuscript record, but from the stones themselves, in the order that he observed them. He begins with writing down three names, then he finds a stone with no inscription, and records that fact, and then passes on to copy the names upon three more. One of these is that of Thoresby himself; the other five are names of his predecessors, every one of which are amongst those which Stubbs mentions as having been buried in the church of York. The motive for this removal is clear; for I have already mentioned, and have shewn in plan No. 4, that the portion of the choir where these stones were placed was first erected, and, lying considerably beyond the choir of Roger, was completed before that was disturbed. Before therefore the latter part of the building was pulled down, it was extremely natural to remove the bodies of those archbishops who had been deposited in the choir above the crypt, to that part of the building which was completed, and where they would be at rest. And to confirm this account it must be noted that seven large stones with defaced inscrip-tions remained until the laying of the new pavement, in front of the chapel, (at V. . . V, No. 5,) at the east end of the presbytery, which chapel, there is abundant evidence to shew, was always known by the name of the Lady-chapel-7. These various statements concur so completely in placing Thoresby's chapel at the east end of the presbytery, that no historian of York ever threw a doubt upon the matter until Mr. Browne published his history, and I am bound. to confess that I cannot agree with him. Having now confirmed the principal assertions in Stubbs' history, it remains only to examine his relation that Thoresby completed the chapel of the Virgin with sculpture and painting. The presbytery, as already stated, was founded in 1361. By comparing the quantity of work contained in it with the average rate of erecting six other buildings of the same class, I have already shewn that nine years were sufficient to complete it in, supposing it to have been carried on with average diligence and funds. But this building was promoted with unusual diligence and great funds, the archbishop himself contributing most largely, and exerting himself to obtain contributions from others. The only fabric roll that remains of this period (1370) witnesses to an expenditure in one year of 627, and to the employment of thirty-five masons and eighteen labourers, the wages of the masons alone amounting to E245. The average annual expenditure upon Ely presbytery was but 018, and upon Exeter much less. There can be therefore no difficulty in believing that the presbytery of York cathedral, which includes the Lady-chapel, was finished and roofed during Thoresby's life, for he died in 1373, twelve years after the foundation stone was laid. Neither can there be any doubt that he might have translated the bodies of his predecessors into his new building, and have prepared his own tomb therein. And as one of his especial objects was to provide a Lady-chapel, lie may be supposed to have fitted up this part of the building with carving, gilding, and painting, under Ills own superintendence, although the choir, namely, the part lying between the presbytery and the great tower, (see plans No. 4 and No. 5,) was not commenced. Mr. Browne has with great care and industry analyzed a number of fabric rolls relating to the works of the church in the latter part of the fourteenth century and beginning of the fifteenth. To him we are most exceedingly indebted for bringing these rolls before the public for the first time, and I can only repeat my regrets that f am compelled to differ from him so completely in the interpretation and application of the information they contain to the history of the fabric. I have now cast a rapid glance over these valuable documents, and can only regret that from the wide intervals of the years for which they have chanced to be preserved their information is of so desultory a nature, affording us Only partial glimpses of operations, without allowing us to discover to what part of the building they belong. However in the latter part of the series sonic evidence of this kind is given in the rolls, as I have stated, and the history of the three towers is pretty well established thereby. But with respect to the period of erection of the presbytery and of the choir, I contend that these rolls give us little or no available information, and that we must seek it elsewhere. If Thoresby finished the presbytery, as I have endeavoured to shew, the only fabric roll of this series that can belong to it is that of 1370, already quoted. There can be no doubt that the next work that was undertaken was the choir, which includes five compartments, and it has two eastern transepts, (S, S, plan No. 5,) which are not distinguishable upon the plan because they do not project beyond the walls of the side aisles. The rolls that immediately succeed the first must therefore belong to the choir, and it only remains to determine. When the said choir was finished. In carrying on works that were so intimately connected with the sacred extremity of the building every arrangement would be made to ensure that the performance of the services should be as little interrupted as possible, and that they should be restored to their proper place after such interruption with every possible rapidity. To this effect the first parts of the work, including four compartments out of the nine which constitute its length, were so arranged, as the plan No. 4 shews, that they could be erected without disturbing or pulling down more than the aisle behind the cast end of the choir of Roger and its crypt. This portion was beyond the high altar, and not essential to the performance of the services. The side-aisle walls of the choir itself could also have been built up to the Early English transepts without pulling clown more than the flanking towers of Roger's apse, as the plan No. 4 also shews. But for the purpose of determining when the choir was finished we must digress a little, to examine when the work that followed it, namely, the great central tower, was commenced. The four piers of the present tower were not newly erected for the purpose of carrying it, but are mere casings of the piers of the Norman tower that was built by Archbishop Thomas. Moreover it appears from the present state of the masonry that the casing of Perpendicular work that now clothes these Norman piers was not carried up all round each pier simultaneously, but that each side received its casing when the arches that abut against each side respectively were erected, as indeed might be expected. For example, when the nave was begun the Norman central tower remained intact with the exception of some Early English work, probably above the roof, (see plans No. 3 and No. 4.) For simplicity let us confine our attention to the history of one of these piers, the south-western, (N, No. 5.) When the present nave was begun (see No. 4) the western face of this pier received a casing in the form of the present half pier, (or respond,) from whence the pier-arches of the nave commence. The pier thus became Decorated on the western face, and remained Norman on the three others. Afterwards the arch that springs from its southern face with its pier was erected, to connect this pier with the side-aisle wall and complete the eastern end of the side aisle. This addition was connected with some curious changes which I will explain below (see chap. iv.) The pier now became Decorated on the western and southern faces, and remained Norman on the other two. But when the time came (plan, No. 5) for completing the central tower in the same style as the choir, then the northern face and the eastern face of our pier received its new clothing as at present, and these two faces were carried up simultaneously, rather more than a century after the western face bad been transformed. If the masonry of this pier be examined, it will be seen that there is no bond between the three works that I have pointed out, and that the beds of masonry of the three respectively are at different levels, shewing that they were, as I have explained, erected independently at successive periods. The same will be found to be the case with the two tower piers that lie to the east, and in connexion with the choir. The eastern faces of these piers next to the choir were completely finished in connection with the masonry of that choir before the other faces were begun; or in other words, the choir was completed up to the tower before the works of the tower itself were commenced, so that it thus became possible to use the choir for the services before the tower work was attacked, and we may therefore be very sure that this was the method of proceeding, for it is incredible that any of the masons would be allowed to work upon other parts of the building which were not wanted for the services, SO 1011g as the portions that were so required remained unfinished. Now amongst the chapter documents there remains an order printed at length below x, dated Nov., 1409, which is to the effect that Thomas de Haxey is to be the supervisor of the work of the fourth pier, that the masons erect a work shop for the same, to be placed between the consistory and the door of the chapter-house, (that 'is, at the end of the north transept at Q, No. 5,) and that in the said workshop there shall be at least twelve masons. It also declares that the coyne8 at the angles of the bell-tower on the outside shall be reduced or removed, and that the wall shall be carried up plain at the corners of the bell-tower. This document fixes the date of the alteration in the tower piers. As the fourth pier is mentioned three others must have been already completed, and as the eastern ones would probably be first operated upon as nearest to the choir, and as the position of the workshop is in the north transept, it may be concluded that the pier in question is the north-west pier. plumber, of the glazier, and of the carpenter, are the same in all three. In 1377 the church of Misterton was appropriated to the fabric of the choir for ten years. The preamble of the papal bull of 1379, by which this appropriation was confirmed, recites that a new choir, corresponding to the beauty of the nave, had been begun to be built, but that a large part of this choir still remained to be completed for want of funds, on account of the badness of the times. The beginning of a new choir here mentioned refers to the presbytery of Thoresby, for the term choir is applied in general language to the entire eastern limb of the cross in the plan Of a cruciform church, although the easterly portion of the same is properly termed the presbytery. The "large part which remained to be completed" must have been the western part of this building, which, from the language of this document, was probably still uncommenced, and the choir of Roger still untouched, in the state of plan No. 4. Some assistance may be obtained in this investigation by observing the parts of the building in which the stone from the quarries of Huddlestone is used. The nave and presbytery are constructed from the quarries of Thevesdale and Bramham, and the Huddlestone was brought into use after the presbytery was erected, as the following account will shew. The Huddlestone is employed (1) at the east end for the four spires, with the battlement round them, and down as low as the roofs; (2) for all the pinnacles and battlements on each side of the roof of the centre and side aisles, from the east end to the centre tower. (3) In the transepts of the choir it is used amongst the Bramham moorstone, from the roof of the side aisle upwards, and in many other parts; (4)for the centre tower from about the window sill; (5) for the west towers from about eight feet below the window sill of the belfry; and (6) for the floor of the whole church"." From this it appears that the Huddlestone was first employed in the eastern transepts of the choir, which belong to the second period of the work, and that it was then employed sparingly, and mingled with other stone; also that it was fully used for all the later works, namely, for the three towers, in all the parts that rise above the roof, and for the battlements and pinnacles of the choir end, which were of course added after the rest of the building was finished. Now Mr. Browne informs us, (p. 248,) that on the 1st of April, 1465, an indenture, which had been held for the last eighty years and bad expired, was renewed for quarries at Huddlestone. This would carry back the first occupation of this quarry to 1385, and thus we get an approximation to the state of the works, for it would shew that soon after that year the western part of the choir was more than half carried up, seeing that the Huddlestone only shews itself in the eastern transepts of the same, and not elsewhere in its walls. In the fabric rolls which Mr. Browne has investigated, the first mention of Huddlestone does not occur until 1421, and this is bought of Sir John Langton, lord of Huddlestone. But the rolls are in so shattered and fragmentary a condition, that we cannot infer from this that it had not been used earlier. After all we must conclude, that when the fabric had lost its vigorous benefactor Thoresby, the new choir was postponed for several years, and commenced probably soon after 1380, that it went slowly on, and was roofed in about 1400, thus occupying twenty years. This rate of proceeding is considerably more rapid than that of the presbytery of Ely, and even greater than the rate at which the nave of York was erected. One of the articles of complaint at a visitation of the archbishop in 1390, stated that, by common report, the fabric of the church is delayed, and the rents and income of the fabric diverted from their proper purpose. Another article oddly declares, that the ministers of the church for the most part persist in wearing "patens and clogges" both in the church and in processions, contrary to decency, to old custom, and the chapter rules. Glazing of the East Window. In 1405, an indenture was made between the dean and chapter, and John Thornton of Coventry, for glazing and painting the great eastern window of the presbytery, which work was to be finished in three years We are not to suppose that the stone tracery of the window was only just completed when this order was given. The plan pursued in the carrying on of works of this description, seems to have been to fill the windows with linen cloth, which gives a sufficient lighting, or with plain glass, until some benefactor could be found to furnish the glazing, or until it was convenient to employ funds for the purpose; it is well known that the glazing of a single window was a very favourite form in which to subscribe to the carrying on of ecclesiastical work in the middle ages. diverted from the more urgent work of completing the masonry (especially of the great tower) to the arrangement and fitting up of a new high altar, stalls, and other choir furniture of a style befitting the new building. For it is impossible to suppose that the entrance of the canons into the new choir could be retarded until this was done. There is good documentary evidence to shew that a new high altar was projected about 1412. Mr. Browne (p. 208) states that before this time it became a custom to bequeath sums of money to this object. In 141S, 1419, &c., bequests are quoted of this nature, and also to the reredos'. In fact, the old furniture of the choir, when removed into the new building, would by its incongruity plead forcibly with the public for the contribution of funds to complete the fittings of the choir in a suitable manner, and the beginning of such contributions, immediately after the time when I have supposed the new choir to have been so occupied, is a corroboration of this view. In 1428, a tenth was granted towards the new building and the principal tabula of the high altar, which was about to be made and set up'. To confirm the opinion that the choir extremity of the church was in a condition to be resumed as the place of the services about 1405, when the glazing of the east window was ordered, it may be remarked that about this time sepulture begins at the east end. It is true that Thoresby and his six brethren were there interred at the beginning of the work, but. we have no record of others. But in 1405 Archbishop Scrope died, and was buried at the cast end; in 1406, and 1418, others of his family were also there buried. Stephen le Scrope of Masham, desires in 1405 to be buried " in novo opere" in the middle of the chapel of St. Stephen, which is the north-cast chapel. In 1409, Thomas Walliworth desires to be buried within the enclosure of the altar of the Blessed Virgin, and near the tomb of Richard le Scrope'. The beautiful monument of Archbishop Bowet was erected in his lifetime, as he mentions in his will in 1423, and it is also alluded to in the will of Archdeacon Pyttes in 1415, as newly built. These and similar cases shew that the east end of the church was accessible, and fit for occupation. At this time also, namely, in 1415, the new crypt was fitted with its iron work, and paved'. But this new crypt was in existence in the year 1399, for it is certain that the crypt or " cruddes," mentioned in the fabric roll of that year (Browne, p. 19S) as containing certain tools could not have been the original crypt of Roger. That, to allow of the convenient construction of the foundations of the new piers, must have been unvaulted, and the pillars reduced to their present level when the choir was begun, about 1380. W. Skirlawe, bishop of Durham, was a great builder, and his biographer, W. de Chambre, attributes to him the bridges of Shinkley, Yarom, and Auckland, the gatehouse of Auckland, the campanile and chapter-house of Howden and the hall of Howden, great part of the lantern of York minster, and great part of the cloister of Durham, besides a gift of 330 marks to the dormitory there. His executors also gave, at his command, 400 marks to this cloister, he having previously given 200. On all these edifices lie placed his arms. He was translated from Bath to Durham in US9, and died in 1406, and it may be supposed that his buildings in the north were all erected after this translation. His will confirms the above account, by shewing a bequest of 100 marks to the fabric of Yorkminster ; and in the fabric roll of 1415 is a receipt of E52 from his executors. He probably gave large sums during his life, the record of which has been lost, for his arms are placed not only on the spandrel of the lantern tower, but also in the south-eastern transept of the choir, confirming Chambre's account of his practice of so stamping his works, and also that he must at least have been a considerable benefactor to the fabric of York; for although be is riot said to have paid all the expenses of the great tower, lie must have given a large proportion to have obtained so much of the credit of that work. This chapter has been inevitably written in a very digressive style, from the nature of the documents upon which it is founded ; the results arrived at may be recapitulated as follows. The nave was founded in 1291, carried on for thirty three years, and finished in 1324, excepting the upper windows and gables of the west front. These were completed about 1338 by Archbishop Melton. The presbytery was begun in 1361, and completed before the founder Thoresby's death in 1373. The choir was commenced, carried on, and completed between 1380 and 1400. The central tower works lie between 1405 and the succeeding years. The south-western tower was erected under Bermyngham, the treasurer, from 1432 onwards for an uncertain time. The north-western tower was carried on about 1470 ; and about the same time the painted vault of the central tower was set up and finished. But the history of the wooden vaults of the presbytery, choir, and transepts, is lost. The wooden vault of the nave was constructed about 1350. Finally, in 1472 it was thought necessary, as the church had been in fact rebuilt, that it should be reconsecrated, which was accordingly effected on the 3rd of July, and that day was decreed to be the feast of dedication of the church of York in future.